Spiro Theodore Agnew was born November 9, 1918, in Baltimore, Maryland. He was the son of Theodore S. Agnew and his Virginia-born wife, Margaret Pollard Akers. Spiro Agnew was, in his own words, a "typical middle class youth" who spoke and wrote very well and gained experience writing speeches for his father's many appearances before ethnic and community groups. Agnew attended public schools in Baltimore before enrolling in Johns Hopkins University in 1937, where he studied chemistry. After three years he transferred to law school at the University of Baltimore, where he attended night classes. He supported himself by working for an insurance company, where he met Elinor (Judy) Isabel Judefind, his future wife. In September 1941 Agnew was drafted into the army, three months before the United States entered World War II (1939–45). After the attack on Pearl Harbor, Agnew was sent to Fort Knox to train as a tank officer. He married Judy in 1942 before leaving for combat duty in Europe. Agnew commanded a tank company, was awarded a Bronze Star (a medal given for outstanding service performed under combat conditions), and was discharged with the rank of captain. After his army discharge, Agnew went back to the University of Baltimore Law School and graduated in 1947. He completed advanced law studies at the University of Maryland in 1949 and passed the Maryland Bar (an association that oversees the state's lawyers) exam. He could now practice law in the state of Maryland. After returning from active military duty, Agnew restarted his own law firm and became involved in Baltimore County's local politics. He joined the Republican Party in 1956 and began working for national and local campaigns. Agnew's first term in public office came in 1957 when he was appointed to a one-year term on the Baltimore County Zoning Board of Appeals. Agnew was reappointed for a three-year term in 1958 and eventually became the board chairman. He ran for associate circuit court judge in 1960, but lost, coming in fifth in a five-person race. Agnew then ran for chief county executive in 1962 and won. He was the first Republican executive elected in Baltimore County in seventy years. Agnew's term as county executive was considered successful, and he became more popular. In 1966 he became the Republican candidate for governor of Maryland. His main opponent, George Mahoney, was strongly opposed to civil rights. Agnew defeated Mahoney and became the fifty-fifth governor of Maryland. As governor, Agnew was known as a progressive leader with moderate civil rights beliefs. While in office he passed several tax reform laws, increased funding for antipoverty programs, repealed a law banning interracial marriage, spoke out against the death penalty, and drafted tough clean water legislation. However, by 1968 civil unrest had grown stronger throughout the United States. Protests had begun against the Vietnam War (a war in Vietnam fought from 1955 to 1975 in which the anti-Communist government of South Vietnam, supported by the United States, fought against a takeover by the Communist government of North Vietnam). Riots broke out in many major cities after the assassination of Martin Luther King Jr. (1929–1968). Governor Agnew ordered state police to arrest civil rights demonstrators, encouraged the use of military force to control civil disturbances, and spoke out harshly against Vietnam War protesters. At the 1968 Republican Convention in Miami Beach, Florida, Richard M. Nixon (1913–1994) was nominated as the Republican presidential candidate. Nixon chose Agnew as his vice presidential running mate. As part of his acceptance speech, Agnew said, "I fully recognize that I am an unknown quantity to many of you." Those who considered Agnew unqualified for national office began saying "Spiro who?" In truth, as the governor of a relatively small southern state, he was relatively unknown within the party. Nixon chose Agnew because he wanted someone who was a southerner, an ethnic American, an experienced executive, a civil rights moderate, and a proven Republican vote-getter with appeal to Democrats. The Nixon-Agnew victory over Hubert Humphrey (1911–1978) and Edmund S. Muskie (1914–1996) was close but clear cut, with a half million popular votes separating winners and losers. After the election, Agnew became the first vice president to have a White House office when Nixon gave him an office in the West Wing. As vice president, Agnew began using attention-getting speeches to attack opponents of the Nixon administration. Patrick Buchanan (1938–), Cynthia Rosenwald, and William Safire (1929–) drafted many of his speeches. The vice president soon became known for his verbal attacks against college radicals, American permissiveness, and the media. At Ohio State University's graduation ceremonies in 1969, Agnew criticized the students' parents, calling their leadership a "sniveling hand-wringing power structure." Nixon again chose Agnew as his running mate for the 1972 elections, and they over-whelmingly defeated their Democrat opponents, George McGovern (1922–) and R. Sargent Shriver (1921–). Early in his second term as vice president, Agnew came under investigation for crimes supposedly committed while he was an elected Maryland official. He was accused of accepting bribes from engineers who wanted contracts with the state of Maryland. He was also accused of failing to report campaign contributions as income. The situation became increasingly tense when Nixon came under attack for his alleged involvement in a break-in at the Democratic Party's headquarters in the Watergate complex. There were rumors that both the president and the vice president might be impeached (tried in Congress for charges of misconduct in office). On October 1, 1973, Agnew pleaded "no contest" in federal court to one misdemeanor charge of income tax evasion. He was fined $10,000 and put on probation for three years. He was also forced to resign from office. Agnew's friend Frank Sinatra (1915-1998) loaned him $160,000 to pay legal expenses, back taxes, and other fees. Agnew was disbarred (not allowed to work as a lawyer) by the state of Maryland in 1974. After leaving politics, Agnew became an international business consultant and the owner of several properties in Palm Springs, California, and in Maryland. In his 1980 memoir, titled Go Quietly or Else, Agnew implied that Nixon and Alexander M. Haig (1924–), Nixon's chief of staff, planned to assassinate him if he refused to resign, and that Haig told him "to go quietly … or else." Agnew also wrote a novel, The Canfield Decision (1986), about a vice president who was "destroyed by his own ambition." In 1981 Agnew was sued by three citizens of Maryland who sought to have the money he had reportedly received illegally from the state returned. After a few years the citizens won their case, and Agnew had to reimburse $248,735 to the state. Agnew died of leukemia in Ocean City, Maryland, on September 17, 1996, at the age of 77. Agnew, Spiro T. Go Quietly … or Else. New York: Morrow, 1980. Cohen, Richard M, and Jules Witcover. 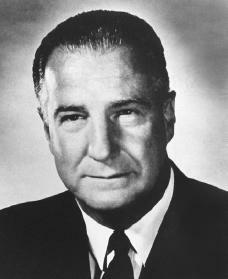 A Heartbeat Away; the Investigation and Resignation of Vice President Spiro T. Agnew. New York: Viking Press, 1974.